but I can still feel the heat on my skin. Ever since I watched Barrett run up the side of a building, drop-kick a reaverbot in the face, and plow through a crowd of people on a hover bike launching pedestrians high into the stratosphere, I have had a burning urge to play the kind of game that a Mega Man Legends made in this decade can be. That dream was all but dead and buried until this month when the Red Ash Kickstarter was announced. My heart rejoiced, and yet… To read the reactions of the general gaming news to this project, this is fast becoming a recurring nightmare. Compared to recent Kickstarted games like Bloodstained or Yooka-Laylee or even Inafune’s own Mighty Number 9, it is true this is not doing as well. There is no shortage of speculation on why that is: Kickstarter fatigue in what has already been a huge year for kickstarted games. Questionable feelings over Comcept and Inafune being greedy or overly-ambitious, or doubts carrying over from Mighty Number 9 (despite the early reviews posted in June that seem to be overwhelmingly positive) or even that MN9 already spent up much of the pent-up Capcom fan rage for its cause. Lack of strong punchy energy-driven video or enough “teaser” time to build up to the launch. For having a separate Red Ash anime Kickstarter running concurrently, dividing the funds. Setting too high of a base goal, thereby killing the momentum. Worries that the game will be “incomplete”. Concern over what console ports will exist (seems premature when we aren’t even sure which consoles will still be supported in 2 years). And finally, that no matter how close it might try to appear, that Red Ash is not the closure to Mega Man Legends’ story that so many fans hoped Legends 3 would be. These are all frustratingly true, and as much as I want to I can’t change any of it. These are the cards dealt, each one a towering colossus casting shadows of doubt and dismay. It brings back memories of the vast oceans of bad press that Legends 3 was plagued with during development, before the Prototype even got the axe. All the “This game won’t be a true Legends game without Inafune!” “This game isn’t even greenlit! They’re holding the game hostage!” “They want us to PAY for a DEMO? !” and “Why 3DS? It needs to be on console!That system is a failure!” (Remember, it was before Nintendo slashed the price and sales shot up exponentially.) And here we go again, so many of the exact same concerns are now popping up with Red Ash, some even in reverse. The worry warts, the console camps, the jilted and the jaded. Just like before, there’s so much derision and negativity that it starts to overshadow anything positive and fun. You can try to chalk it up to mismanagement, bad timing, or circumstance beyond anyone’s control, but in the big picture it might be all that and more. Legends has been out of place since the very first game, always struggling to connect to an audience, always polarizing to fans and players. Perhaps what history is telling us is that a Legends styled game in any respect is indelibly cursed. What it all adds up to is making me feel sick. So many headlines are ready to call it a stallout and a failure after just one week. The goal isn’t even quite at the halfway mark as of this post. Now this in itself is not unusual for Kickstarters in general. The way it is trending, it should reach its goal (if you put stock into such projections), but until it actually does there’s a strong chance that the amount of negative press is going to impact the results. Don’t go believing there is no such thing as bad press. There is. We’ve become so accustomed to big name game projects being all about the stretch goals that this kind of progress — though steadily climbing towards the initial goal and then some — is just slow and dull by comparison. Because Inafune is headlining this, we expect better turnout. If it doesn’t blast past the initial goal in a matter of days, it might as well be dead. Kickstarter is increasingly becoming about the hype the indie developer can generate to get additional funding from publishers while maintaining creative control. It is an initial outpouring of potential profitability. It is part fundraising and part advertising. But the support this is raising is not positive. Unless Comcept turns this around in a big way, the headlines even after this game reaches its goal are going to declare how Inafune barely scraped up enough support. How this project just limped along to the goal by handful of diehard fans so desperate they will settle for an off-color bootleg. The message this is sending is that Capcom was right about cancelling Legends 3, because there is just no market for a game like that. And that’s what’s killing me most of all. If you’re really not interested, okay. I’m not going to twist your arm. But if you have the means and you’re on the fence about supporting this, I really encourage you to jump in. $5 will get your name in the credits and up the numbers tally of support. $25 will get you the PC digital download of the game itself. Odds are you will have a computer that can run the game by then, but if you don’t, hey, maybe you can come over and play it at my house. If you don’t have any change to spare, there’s still one more day for Loken’s caption contest. Entry is only the time it takes to register on Proboards for the Mega Man Legends Station forums and send him a private message with something silly for Volnutt to be saying in this picture. Do that and he’ll donate $5 for you. It doesn’t get much easier than that. Just don’t wait. We still have over 2 weeks left, yes, but we may never get a second chance at this. I don’t know what to tell you. Let’s breathe some heat back into these ashes, get this fire going again. I can’t take watching this burn out. 13 Comments to "Seeing Red"
Great article- if there’s one thing Mega Man Legends 3 taught me, it’s to not take anything for granted. man. You summed up my thoughts perfectly. I really hope we at least make the initial goal. Or that I could do something to change minds but people are pretty stuck in their opinions I guess. The idea that Legends as a series – and anything attached to it such as Red Ash – is somehow cursed makes a strange sort of sense. I agree wholeheartedly that it has always struggled to some degree, but out of all the many games Megaman has had, for whatever reason Legends is the one that got hindered at every step. I personally think it’s the best series Megaman’s had, but I can’t change the minds of those that won’t or can’t listen. 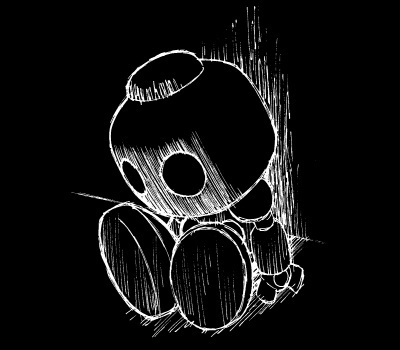 However, I can’t deny my feeling on edge about Red Ash, both for the reasons given above and because I’ve just become so jaded and bitter about the industry in the last 15 years. Still, as I said in a Tumblr post, whatever my feelings are I hope it does and well and is successful. So much of this article rings incredibly true, but beyond that, I really do feel that trying to ride Legends is only hurting both it and Red Ash, if not now, then definitely in the long run. Whether successful or not, I don’t see this Kickstarter particularly impressing Capcom. And be real, if Mighty No. 9 hasn’t gotten us any new Classic/X announcements for Mega Man, how much would this have done anyway? There is another kind of fatigue at play, that of a fanbase that’s been told time and time again that they should be supporting someone else’s work in the hopes of inspiring Capcom to act, to buy things we “almost” want for lack of a better way to communicate what we REALLY want. But the reality is sinking in that theres enough merchandising and licensing within Capcom’s walls that such a tactic, if it would work, should by all rights still be able to stay within the franchise. So I arrived at this conclusion: I backed Red Ash for Red Ash’s sake, because the style similarity is enough to appeal to me. But I did not, and will not, back Red Ash either because I’m willing to accept it as “the closest we’ll get” or because I think it’ll somehow lead to Capcom reinstating the Legends series. Unfortunately, that’s the grounds on which a lot of Legends fans try to push Red Ash, and I truly feel that approach will only backfire in the end, regardless of how much money is raised. To be frank, I was initially jaded at Red Ash’s announcement. It was very low-key compared to the blitz caused by Mighty No. 9, and I had several concerns that you nicely addressed in your post. However, I was still hopeful for this project, because to me, this isn’t about “replacing” Mega Man; it’s about putting faith in the kinds of games that are increasingly losing ground outside of a niche among indie developers. That said, I was still hesitant to back this project since I’m still waiting on Mighty No. 9 and I’m making an effort to keep my costs low. Then Zan Sidera brought the July 17th promotion to my attention, and I gave the Kickstarter page another look. 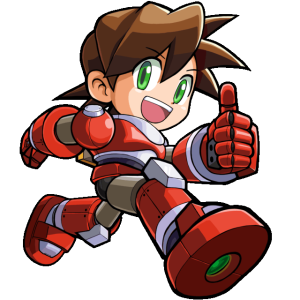 While the presentation is still very barebones, what I saw wasn’t simply Mega Man in red: it was the promise of an open world game filled with fun, adventure and mystery revolving around very charismatic characters. So I decided to back the game. I don’t want to think of this as a replacement to Mega Man, because we’re not going to see Volnutt, the Casketts or the Bonnes here. For that, we’ll have to hold on to hope that Capcom will someday get their act together and take MM out of the nostalgia trip that started years ago with MM9. Like Hypershell above, I intend to view Red Ash for what it is, and look forward to the experience that I’m confident Keiji Inafune can deliver. And I hope not only Legends fans, but also casual gamers can see the potential in this concept. And on that note, I actually think that producing an anime in parallel to the game is an excellent idea. It can serve as a better advertisement than any commercial, making it the perfect method to attract a wider audience. It has worked for Transformers, Pokémon and even Sonic Boom (despite how poorly the latter’s games were received). So here’s hoping that Red Ash can enjoy similar success in the long run, because the way I see it, it’s the younger generations that aren’t burdened by memories of Mega Man Legends that will determine how relevant this style of game is in this day and age. We just need to give it, well… a kickstart. There is one other thing I want to say, with regards to the whole “Why 3DS?” thing with Legends 3. Nobody could know exactly what the future would bring, that the 3DS would dominate the market the way it did, but anyone who thought the situation would not improve in some way by the end of that year was a fool. Mario Kart, 3D Land, and Capcom’s own Monster Hunter 3 Ultimate (in Japan, anyway, and in Japan Monster Hunter is a really big deal) were all expected to hit in 2011’s holiday season. If you did not believe that the 3DS’s install base was going to grow significantly well before Legends 3’s development would have completed, you were a freaking moron. Adding insult to injury is that a month after L3 was cancelled it became known that the Vita would not make it overseas by then, meaning that outside of Japan the 3DS would enjoy no competition during that season. Nintendo went about the price cut/free games because they did not believe they could wait that long to build momentum (and given what happened with the WiiU, they were probably right). I’m also sore over the fact that the “Prototype” demo/prologue would have been the only exclusive gameplay experience on the entire 3DS eShop for its first five months had Capcom actually followed through (the first eShop exclusive video game was Freakyforms; everything else was an app, port, or VirtualConsole). Just wanted to thank everyone for their support, and for all of these well thought-out and insightful comments. For anyone wondering, the recent lack of updates here is a mix of my being really busy lately, and me being preoccupied with following the RED ASH campaigns — which I kind of want to write about, and I kind of don’t want to write about. Maybe you understand what I mean. Although the Kickstarter didn’t go well, we can look forward to play the game in the future. There is a reason Capcom fired Inafune. Red Ash is never happening. Mighty Number 9 is a joke. Megaman is a dead series, and this site functions on picking clean the desiccated corpes in the hopes of gaining nourishment where there is none to be found. Capcom did not fire Inafune, he quit. Mighty No. 9’s production process was disappointing due to poor planning and unclear expectations. How the game itself performs is yet to be seen. Red Ash is Fuze’s problem now. Inafune has a lot to learn about being an indie. I don’t fault him for having room, and honestly, NEED, to grow, but it is a big reason why I am indifferent to Red Ash’s failure. He thinks of himself as being open as devs go, and compared to the AAA scene he is used to, he very well is. But when you reach for crowd funding there’s a whole other set of expectations that he was simply not prepared for. He goes to Kickstarter with no real game assets, very little to show beyond concept art. When we all wanted to screw Capcom over with MN9, that was enough. But ordinarily, it takes more than that. You need to build a certain level of trust and confidence to justify a cash flow from the general public. It is not the same thing as dealing with business investors, and Inafune had to learn the difference the hard way. That’s really all Red Ash amounts to.